While progressives, women’s rights advocates, journalists, and the LGBTQ community were among the many mourning Brazilian President Jair Bolsonaro’s inauguration on Tuesday, U.S. Secretary of State Mike Pompeo angered critics with a celebratory tweet congratulating the proud misogynist who has defended Brazil’s former military dictatorship and vowed to crush the country’s leftist opposition during his first speech as president. Pompeo tweeted that he was “looking forward to witnessing the peaceful transfer of power in one of Latin America’s strongest democracies,” as international observers warned that Bolsonaro’s presidency is likely to usher in a new era of fascism. “One of Latin America’s Strongest Democracies”, really!? It is possible Bolsonaro will govern as a true autocrat―that he could take advantage of any small crisis to consolidate power and sweep aside democracy in a single act. He could close Congress; he could criminalize the Workers’ Party and other leftist opposition parties and movements; he could criminalize dissent, protest, and the free press. More likely is that he will govern in a manner similar to Trump, targeting the press, political opponent, and democratic institutions with a constant barrage of criticism that further erodes their credibility among his supporters and the public writ large, and has a chilling effect on legitimate opposition. In his inaugural speech, Bolsonaro pledged to combat “the Marxist trash that has settled in educational institutions,” and his administration has already appeared to begin a crackdown on the news media, with journalists’ access to the inauguration severely restricted. Bolsonaro’s inauguration imposes serious restrictions on journalists. “One of his most influential supporters has called journalists ‘the biggest enemies of the people’ and in comments reminiscent of Trump’s repeated attacks on the media, Bolsonaro singled out Folha for particular ire and threatened to review the government’s budget for media spending,” wrote Andrew Downie of the Committee to Protect Journalists (CPJ) ahead of the inauguration. Bolsonaro has expressed admiration for Trump while the U.S. president spoke of “a strong commitment to work side-by-side” after the new Brazilian leader was elected last fall. 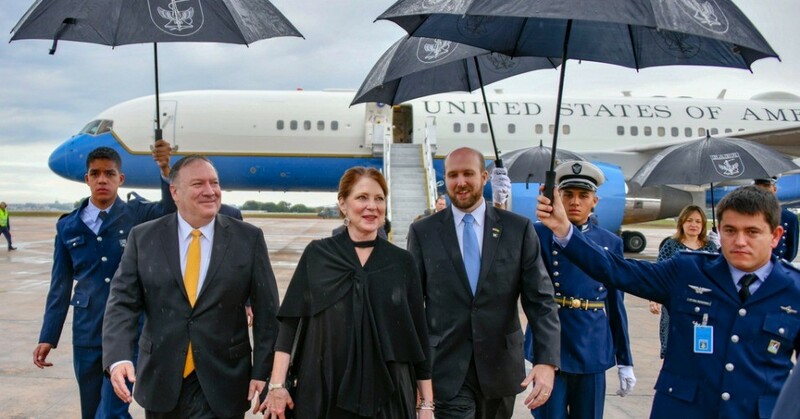 The alliance, further demonstrated by Pompeo’s whitewashing of the inauguration, has provoked outrage and fear among progressives in Brazil, the U.S., and around the world. “Bolsonaro has modeled his ascent to power on the rise of Trump, whose own victory was built on years of democratic erosion. Trump, too, was merely a symptom of a larger disease, a product of declining faith among Americans in their democratic institutions,” wrote Waldron. This entry was posted in Civil Rights, Corruption, Elections, Government, Human Rights, International Agreements, Media Issues, Military, National Security vs Police State and tagged Atrocities, Brazil, Civil Rights, Corruption, Elections, fascism, Freedom of Press, Human rights, International Agreements, Jair Bolsonaro, Media Issues, Mike Pompeo, Military, Police State on January 2, 2019 by MNgranny.